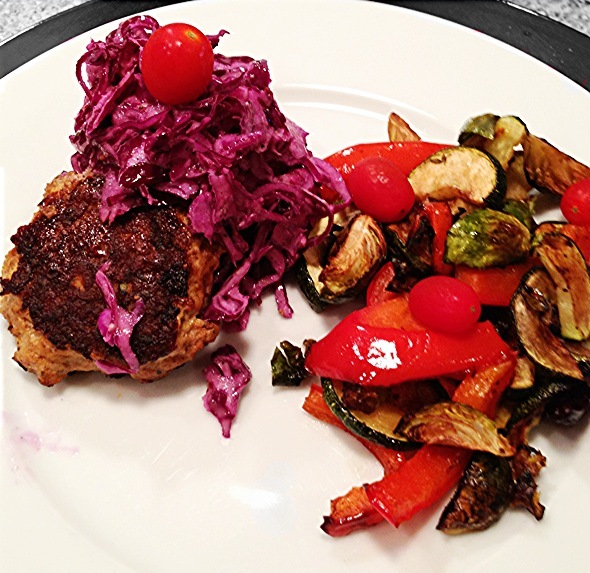 Turkey burgers with coleslaw – Another winner, the kids loved them! If you haven’t noticed I love cabbage in all its forms and colors. Cabbage has a lot of vitamins and minerals and is loaded with antioxidants that are good for you i.e. liver, immune system and your metabolism. How to: Mix the ingredients for the burgers and them into make patties. Grate or cut (I used a cheese slicer) cabbage and sprinkle the Vinegar and Salt and Pepper over the cabbage. In a different bowl mix together the Yolk, Mustard, Vinegar, Salt, Pepper and Chili. I always use an electrical beater when I make mayonnaise, add the oil very carefully in a fine stream while you whisk. Mix the mayonnaise with the cabbage and store it in the fridge until ready to serve .When you have everything ready fry the patties but make sure they are thoroughly cooked as bird meat can carry salmonella. I was going to make buns using almond flour but in to be perfectly honest I ran out of time so I ended up roasting veggies instead.